Installing a lavatory faucet or a kitchen faucet can be backbreaking work. You need to crawl under the sink into a cramped, dimly lit space in order to thread and tighten the faucet lock nuts, and then install the supply lines. This is often done while laying on your back on a very uncomfortable, uneven surface. You may have thought to yourself, there has got to be a better way to install a faucet. Well, now there is! This clever, patented device will make faucet installation much quicker and easier. No longer will you need to work upside down, straining your back muscles, endlessly spinning the faucet nut or locknut up the faucet shank in order to install a lavatory faucet or kitchen faucet. Can’t view the video? Scroll down to view the animated image below to see how the Sinchnut is installed. If you would like to read the video transcription, you can read it at the very bottom of this article. With the Sinchnut, you can connect the supply lines to the faucet first, before you even put the faucet into the holes of your sink. Once the supply lines are attached to the faucet, you can then insert the supply lines and the faucet into the mounting holes. Next comes the Sinchnuts. Unlike regular faucet lock nuts which are usually made of solid pieces of brass, Sinchnuts are made of two plastic pieces that are linked by a hinge that allows you to open and close the nut. Once your lavatory faucet or kitchen faucet and supply lines have been inserted into the holes of the sink, all you have to do is open your Sinchnut, wrap it high up around the faucet shank, and close the Sinchnut, locking it in place with a click. Then turn it until it is tight, just like you would an ordinary locknut, and you’re done! No more backbreaking, upside down faucet installations. See how easy it is to install this new faucet locknut called the Sinchnut in the image above. Simply close the clasp, lock it into place and voila! Your new faucet installation is secured with the newest and easiest faucet shank lock nut solution. Equiparts has Sinchnuts in stock and ready to ship. Give us a call and make your next faucet installation a Sinch! View the Sinchnut on our website to add it to your online quote, or give us a call to place your order. Not interested in the Sinchnut? Then learn about the SaniGuard Fogger, another fabulous product that sanitizes an entire room, vehicle, or area in mere minutes. Read the Sinchnut (Faucet Lock Nut) Introductory Video transcription below. This is for those of you that cannot view the video. Hi this is Jim with Equiparts, I’m here to show you a new item called the Sinchnut. 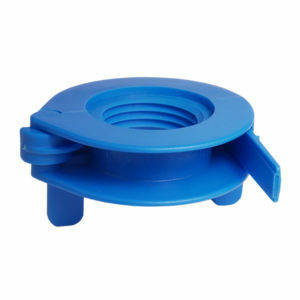 The Sinchnut helps you install a lavatory or a kitchen faucet faster and easier than traditionally. We are here at our test station and normally, what you do is when you install your faucet, you put your faucet in the holes and you tighten up the faucet lock nut. Then you go back under and add your supply lines. In this case with the Sinchnut, you can install your supply lines first, put them down through the holes, and then, you snap on your Sinchnut(s), do a few turns, and it’s tight. As you can see, this is hinged. So you can wrap it around the shaft of the faucet. It opens and closes easily. Call Equiparts today for your new Sinchnuts and thank you for watching. Reference part #68691. 800-442-6622.